Crown gents saw 4 inch 25 tpi. 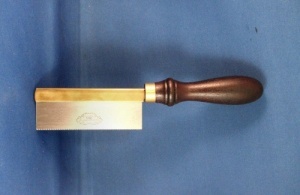 The Crown hand tools 4 inch gents saw has a full length brass back and a turned rosewood handle. The 25tpi blade is especially fine for small work.